The West Seattle Food Bank has launched a new website. 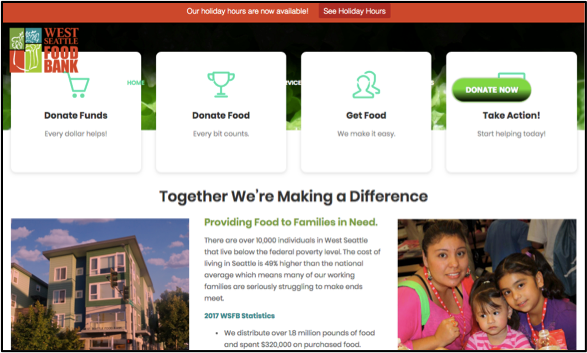 The new site – which is streamlined and simple to navigate – makes it easier than ever to learn about the food bank’s services, impact, and ways to get involved. In 2017, the West Seattle Food Bank distributed 1.8 million pounds of food in support of more than 10,000 individuals. Through its innovative shopping-style model; Mobile Food Bank services, including four off-site distributions and home delivery program; backpack program; baby & child corner; community connection services; bookcase; pet pantry, and, 513 volunteers, the Food Bank is committed to providing food security and community connections to neighbors in need.